"The balance of these signals is fundamental to the understanding of the pathogenesis of inflammatory liver disease and to design new therapeutic approaches to reverse this disease," says Dr. Erwin Wagner. A study published recently, and carried out by Erwin Wagner's team, Director of the BBVA Foundation- Centro Nacional de Investigaciones Oncologicas (CNIO) Cancer Cell Biology Program and holder of an ERC Advanced Grant, shows how the immune system 'attacks' liver cells during hepatitis by using the AP-1 gene JunB. Latifa Bakiri, one of the study's authors and a researcher in Wagner's laboratory details: "The activation of the JunB/AP-1 gene in a subset of immune cells, called NK cells, increases the production of interferon-gamma that attacks liver cells while the organ is suffering from hepatitis." With this discovery, the study's authors propose a new mechanism by which AP-1 acts as a double-edged sword in the liver: it's a first line of defense against viruses that cause the disease, but also encourages liver damage depending on the diet or genetics of the patient. "The balance of these signals is fundamental to the understanding of the pathogenesis of inflammatory liver disease and to design new therapeutic approaches to reverse this disease," says Wagner. NK-type immune cells are also part of the micro-environment surrounding tumors. Researchers point out in the discussion of the article that a better knowledge of these cells may be vital for designing immune-therapies that specifically target tumor cells. 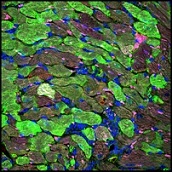 Illustration: This is an inflamed liver containing immune cells expressing AP-1 protein (brown). –Centro Nacional de Investigaciones Oncologicas (CNIO).